Having been frozen out the week before, there was a positive return to action for Leadenham Hockey Club’s men’s third team and ladies’ First XI. In a late pushback at Alford, the Thirds exploded out of the starting blocks to take an early lead through debutant James Mountain. Mark Wrigley made his return from injury and put in a strong performance as Leadenham maintained possession, and crisp pass and move hockey allowed Curtis Turner to double the lead. To their credit, Alford battled hard throughout and grabbed a consolation goal in the latter stages, but Leadenham held firm to win 2-1. The ladies continued their run of good form with a 5-1 win away to Woodhall Spa. With a line-up featuring several defensive players in forward positions, Leadenham initially struggled to break down a resilient Woodhall back line. Woodhall took an early lead on the counter-attack, which encouraged them to push forward and opened up space for Leadenham to exploit. Ellie Talton and Katie Ireland gave the visitors the edge at the end of the first half. Ireland struck again in the second half, with man-of-the-match Ciara Wright adding another two as Leadenham controlled the ball and saw the game out. Despite these positives, there was continuing concern over the form of the men’s First and Second XI who both continued a run of consecutive defeats since the Christmas break. Welcoming Ely City, the Firsts started late, relying on keeper Simon Chambers to break up attacks and he kept them in the match for much of the first half. Emerging after the break 2-0 down, the home side made a spirited comeback. Tireless work from James Porter in the midfield and creativity in the attacking third from Ben Huggins enabled Charlie Cade and David Nelstrop to get on the scoresheet. Unfortunately two further Ely goals gave them a commanding lead and the final whistle halted Leadenham’s resurgence. 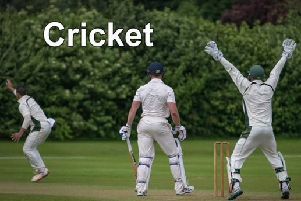 The Second XI remain precariously balanced between safety and relegation and a home match against St Ives offered the chance to pick up much-needed points. But the visitors were clinical in their finishing, fashioning few chances, but converting often. Man-of-the-match Ben Lane led a valiant defence, but with the team lacking goals and self-belief, they fell to a 5-0 defeat. The club thanks all of the umpires, with special mention to home officials David Sykes, James Ireland and Sam Macallister. Leadenham would also like to thank team sponsors Mountains Skip Hire.